With the ever growing list of solar yard lights available today, it can become time consuming and difficult finding the information you need to make a good buying decision on solar landscape lighting. On our solar landscape lighting review pages we also include places that you will be able to shop for these products online as well as compare prices from these different online stores. We have also added a page for best solar lights. We have chosen these based on consumer reviews for there performance and illumination. This solar power address light is weatherproof and made out of ABS. The built in light sensor turns the the unit on/off automatically. The solar panel that sits on the top can be removed for a better sunlight placement up to 8 feet away. There are several different manufactures that make this type of light. Some call them spots lights and Malibu calls them flood lights. This could be misleading to some people who expect a solar light to deliver as much light as a regular 120 volt spot light or a professional grade low voltage spot light. This solar shed lighting kit uses a remote solar panel that you attach to the outside of your shed and comes with two 8 watt fluorescent bulbs. This solar landscaping light set features a stainless steel finish that is corrosion resistant. Each light contains two 600 mAh NiCad batteries that charge each day when placed in a full sun area. Lighting is provided by two LED bulbs inside ribbed glass. Solar tiki torch lights are very popular for the garden. Solar tiki lights take you to the next level by giving you the look of a tiki torch with the safety of solar lighting. There are no open flames or electric wiring to contend with. If you want to add a little color and magic to your garden consider floating solar globe lights. These small little globes can make a big impact on your family and guests as they admire the changing colors. They can be floated on a pond, set on tables with small pedestals, or placed amongst the plants on stakes. Solar powered motion lights are a great way to add security to your home without adding to your utility bill. Post the motion light wherever it is convenient, and when an intruder approaches the house, the motion sensor will trigger the light to come on. Have you ever thought of adding a solar powered flood light to your yard or garden? We all have those areas in our yard where we could use a little light. Maybe you want to highlight your driveway or a special nook in your garden. A solar powered LED shed light may be just what you need to illuminate your garden shed or greenhouse. This light allows you to add light to a small structure without worrying about wiring and electricians. 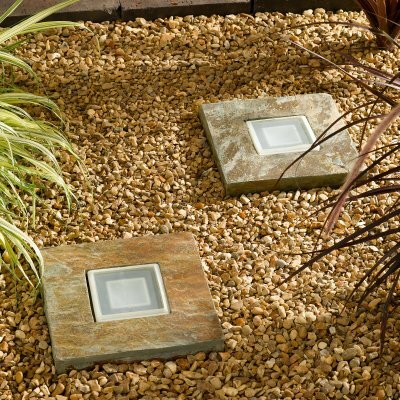 Solar pond lights can add mood lighting to your yard. Float them in your water feature, hot tub or pool to add a glow that will reflect in the water. This low lighting can create a magical, romantic feel to your garden. 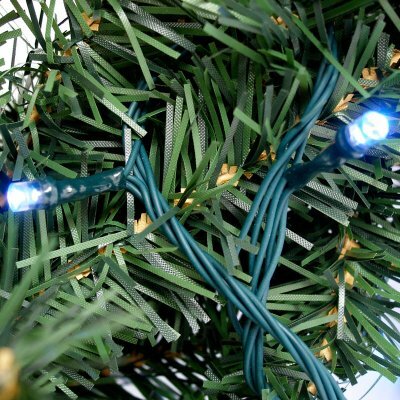 Save money this holiday season by decorating with solar LED Christmas lights. Now you can decorate all those hard to reach areas that don't have a convenient electrical outlet. You can easily use them anywhere you have room to install the small solar panel. This easy to install hanging solar light will look nice in any garden. Complete with a traditional shepherd's crook hanger, the light will hang high enough to be an attractive feature itself. These solar brick lights make it easy to illuminate your pathway and are sure to bring you many compliments. Just install the brick-sized solar lights into your brickwork for an attractive method of lighting the way. Solar umbrella lights are a perfect way to add a little mood lighting to your outdoor entertainment area. The soft glow of the solar lights adds romance and magic to your deck or yard. Use these attractive solar stake lights to add a nice accent to your landscaping. They come with a solar panel to collect energy from the sun to create a nice illumination at night. This solar outdoor security light will help keep your home safe by providing light while saving energy. It detects motion and turns on a safety light, discouraging break ins and other problems. Add some light to your deck railing or backyard fence by installing this solar post cap light. With no wiring to worry about, you will have the added benefit of light and security without the hassle of hiring an electrician. A solar power security light will eliminate the need to keep a light burning outdoors all night long, adding to your electric bill. This light does it all for you, it turns on automatically when it detects any motion within 35 feet. Three rechargeable batteries are included, making it even easier to install. These solar wall mount lights are easy to install with minimum effort. Made of durable stainless steel, they are as attractive as they are useful. This modern, sleek solar light are perfect for fences, columns, and walls of all sorts, as well as being perfect to install horizontally to accent anything you'd like to put in focus in your landscape. The solar powered security light works well for driveways, walkways, sheds and garages. The light has an automatic sensor that makes it turn on when motion is detected. These beautiful stainless steel solar powered yard lights will make your yard look terrific. Perfect for your patio, walkways, driveway, or garden, these lights feature a very sensitive PV solar panel. The panel is the same as those used on solar powered calculators.